Enjoy the culture, history and natural beauty of Goa’s Central and Interior region during your Goa holidays, from colonial heritage to natural splendour. Inland from the coast, the region has a varied landscape, from lush tropical jungle and verdant covered mountains to industrial honey pots and large bustling towns. The region is home to some of Goa’s most impressive sights including the state capital of Panjim, the UNESCO World Heritage Site of Old Goa and the picturesque Dudhsagar Waterfalls. 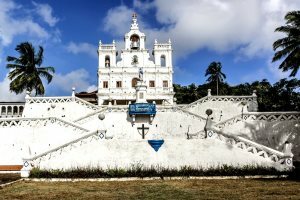 Culture vultures and lovers of nature will find great interest in visiting this region during their holidays in Goa, swapping the sun, sand and sea for churches, markets and waterfalls. 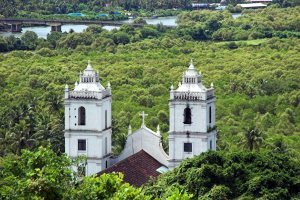 The state’s official capital is located on the banks of the River Mandovi, presenting an avenue into Goa’s colonial heritage, home to many colourful Portuguese houses and striking landmarks. Old Goa was once the largest, richest and most splendid city in the whole of Asia. Today, many of the churches and buildings have been beautifully preserved giving Old Goa some of the best Renaissance architecture in the world. Just inland from Panjim, Ponda is set in the true heart of Goa, surrounded by rice paddies and vanilla groves. 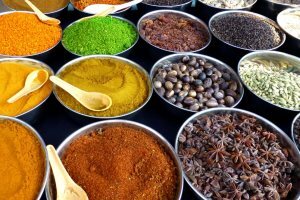 The area is famous for its fragrant spice plantation tours and beautiful Hindu temples. 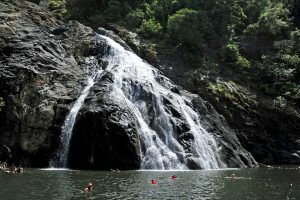 On the eastern most edge of the state lies the famous Dudhsagar Waterfalls. The second-highest waterfall in India measuring an impressive 603m, the falls are quite a prospect, surrounded by dense jungle forest and with a railway line passing through. Please find below a selection of our accommodation in the Central & Interior region of Goa.